Sargent & Company was founded in 1810, in Leicester, Massachusetts. The company first made hand cards, used to prepare wool for spinning. From this modest beginning, Sargent grew into a major hardware supply firm, selling its own as well as other manufacturers’ products. 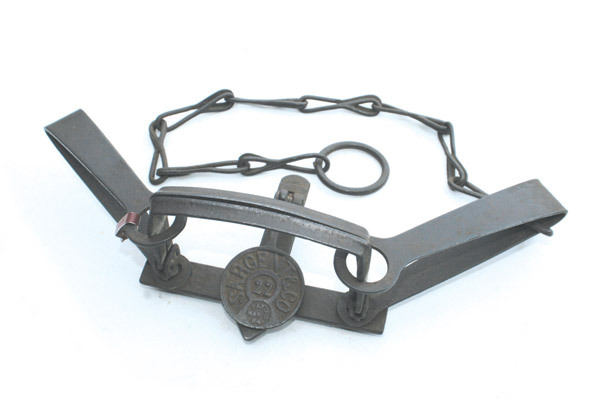 In 1864, the company moved its production operations to New Haven, Connecticut, and in 1884, Henry B. Sargent patented his first steel trap, with the patent relating to a tilting or canting of the spring eye so that the free jaw of the trap would lie flat when in the set position. In addition to traps, Sargent & Co. continued to make a variety of items for the home and farm, which they sold through wholesalers, jobbers and sometimes directly to retailers. By 1888, Sargent & Co. was making a series of dogless traps that featured nearly rectangular cast jaws, were offered in size 20 (comparable to a modern No. 0) to 24 (No. 4 size). Sargent went on to produce several distinct lines of traps, with pans ranging from a square, sheet metal style to a round, two-hole version. None of these traps exceeded the company’s size 24 designation. 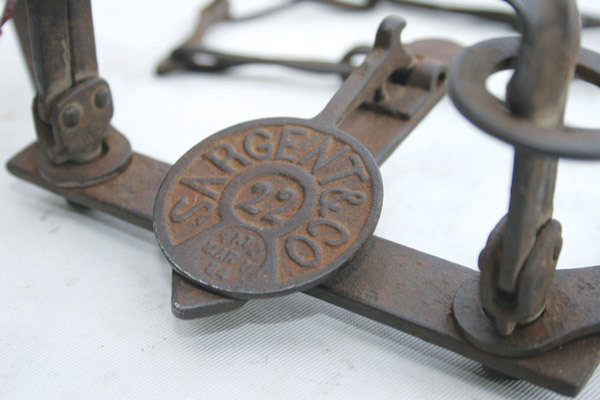 Around 1910, Sargent began selling their first jump or underspring trap. These traps were offered in both single and double-spring versions, in six sizes. The pans on the first made were stamped Blake Pattern Jump Trap, Sargent & Co along with a number from 60 through 64. Traps stamped Blake Pattern Leap Trap, size 70 through 74, followed. The Sargent line of trap is very collectible today, with the early 20 series and the Blake Pattern traps being most sought. Collectors price desirable models from $200 to as much as $500 each.